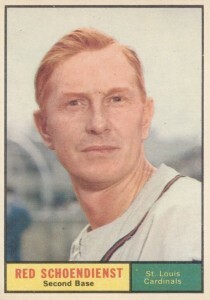 A fan favorite for the St. Louis Cardinals as both a player and manager, Red Schoendienst spent the majority of his life in major league baseball. In this top list of the best Red Schoendienst baseball cards issued during his long career, we highlight key Bowman and Topps appearances from his playing and managing days. Wherever Schoendienst went, success soon followed. He was part of eight pennants and five World Series-winning teams over his entire career. He won two titles as a player, including one with the Cardinals in 1946. He added another with the Braves while in Milwaukee in 1957. 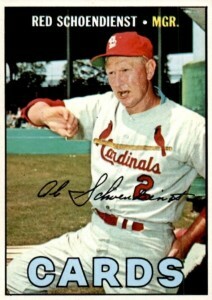 Schoendienst also managed the Cardinals to the 1967 championship and coached them to two more in 1964 and 1982. Over his playing career, Red was a consistent .289 hitter, notching 2,400 hits and earning spots on 10 All-Star teams. His impressive .983 fielding percentage helped him lock down a selection by the Veteran's Committee to the Hall of Fame in 1989. Shop for Professionally Graded Red Schoendienst Cards on eBay. 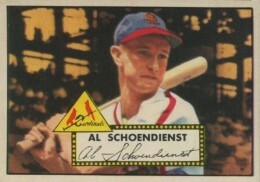 Outside of the cards included on this list, you can find many other interesting cards for Schoendienst. His final appearance as a player came in 1962 Topps and, during two of his brief tenures as interim manager for the Cardinals, he had cards in 1981 Donruss and 1990 Topps. Because Red Schoendienst has hundreds of cards to his name through his many decades of service, it is no small task narrowing the choices. While considering the composition of this list, card value is the major factor that was balanced against the desire to build a collection covering all aspects of his impressive career. Collectors have many options in finding a Schoendienst card from his managerial days with the Cardinals and 1967 Topps is a beautiful example of him instructing from the dugout. He would manage the Cardinals to back-to-back National League pennants in 1967 and 1968 and was named Manager of the Year both years as well. In total, there are 33 cards in the unnumbered 1954 Red Heart Dog Food set with those cards further divided into three 11-card groups showcasing green, blue or red backgrounds. Collectors have found the cards with the red backgrounds to be the most scarce, making Schoendienst's one of the most valuable in the set. Red's brief tenure with the New York Giants is only memorialized in 1957 Topps, with him in a fielding pose. What Schoendienst lacked in hitting (his personal high for home runs in a season was 15), he more than made up in the field. His 1956 fielding percentage of .9934 would be the record for second basemen for more than 30 years. 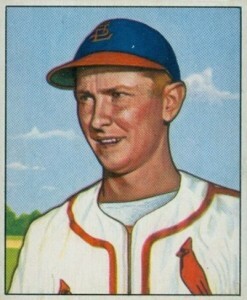 Red Schoendienst is one of just a handful of players to have appeared in every one of Bowman's original baseball sets. You can find his card in each of Bowman's eight sets, including his 1950 Bowman card below. Tracking down a copy of every appearance would make an interesting collecting project for a Cardinals fan. 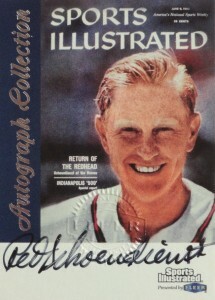 Albert Schoendienst was given the nickname "Red" from his striking auburn hair. His 1961 Topps issue stands out as it is one of the few cards that features his hair color prominently. Topps would often photograph players with and without their baseball caps to allow for a possible change of team over the course of the season. 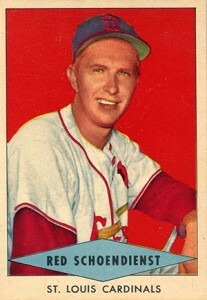 Red returned to the Cardinals from the Braves for the 1961 season and he is clearly wearing a Milwaukee Braves jersey but the card is attributed to the Cardinals. Compare Red's 1952 and 1953 Topps cards and you will probably notice they have nearly identical stadium backgrounds. This is likely St. Louis' Sportsman's Park, the home of the Cardinals, which would be renamed to Busch Stadium in 1953 and become the first of three different Cardinal stadiums named after the bottling company. With a last name as long as Schoendienst, it is crucial that an autograph card provides enough space to accommodate the signature without it becoming cramped. His signature fits nicely on an early certified autograph from the 1999 Fleer Sports Illustrated that features a reproduction of the June 6, 1960 Sports Illustrated cover. 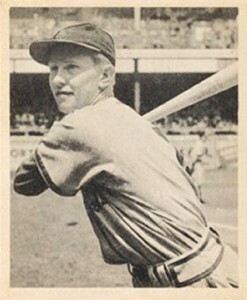 The magazine article highlights Red's return to the game after missing nearly the entire 1959 season due to a bout of tuberculosis. While Topps would make their sets in 1955 and 1956 completely horizontal in design, there were a few cards in the 1952 set that were flipped onto their side as well. Along with stars Gil Hodges and Johnny Mize, Schoendienst's card is one of those options and he is shown following through on a swing with the grandstand behind him. 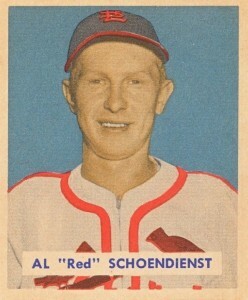 The earliest Red Schoendienst cards include a mixture of different first names, with some using Al and others his nickname, Red. His 1949 Bowman card includes a nameplate with both names while cards before #109 on the checklist had no name included on the front of the card at all. 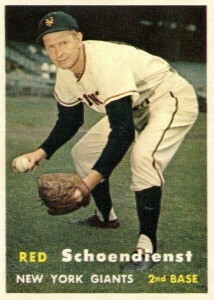 Schoendienst's card is a great example of how the Bowman process of layering colors over the top of the black-and-white photo could deceive the eye into thinking it was a full-color photograph. 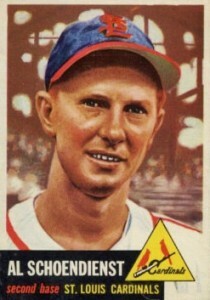 Schoendienst had been in the major leagues for four seasons when he was included in the 1948 Bowman set. In total, '48 Bowman had just 48 cards with #37-#48 being considered the high-number series, giving Red's card #38 a value boost. While the sole Schoendienst rookie is somewhat overshadowed by the official rookies for Stan Musial and Yogi Berra that are found in the same set, prices can still push well into the hundreds for high grades. I sure wish Topps would bring back managerial cards.